What Are the Health Benefits of Eating Brussels Sprouts? Brussels sprouts fall into the cruciferous category of vegetables, which also includes broccoli and cabbage. This group of vegetables offers a unique composition of antioxidants that promotes good health. Additionally, brussels sprouts are low in calories, while offering protein, vitamins and minerals to support a healthy body. 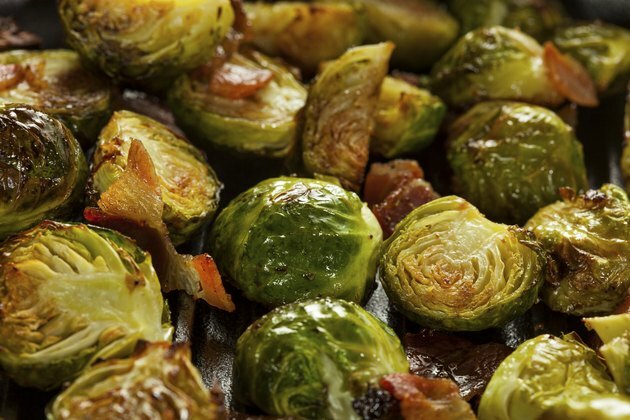 In 1/2 cup of boiled, unsalted brussels sprouts, you get just 28 calories and only trace amounts of fat. Eating Brussels sprouts as a side dish, instead of a higher calorie food, can help you manage your weight. Brussels sprouts provide 2 g of protein per 1/2 cup. Although the sprouts lack several of the amino acids necessary to make it a complete protein like meat or dairy, you can include grains, such as brown rice or whole wheat pasta, in your diet to obtain all the amino acids you need. Brussels sprouts are a source of digestive-regulating fiber. Of the 6 g of carbohydrates in ½ cup of boiled sprouts, 2 g come from fiber. The Institute of Medicine recommends women consume at least 25 g of fiber daily and men 38 g daily to help protect the health of your colon, prevent constipation and contribute to lower cholesterol. Brussels sprouts provide you with 20 essential vitamins and minerals. A ½ cup serving provides 48.4 mg of vitamin C, an antioxidant, and 604 IU of vitamin A, which supports healthy eyesight. Brussels sprouts provide more than a day’s worth of vitamin K for men, and 91 percent of the daily value for women. Vitamin K is intrinsic to the blood’s ability to clot and may help strengthen your bones. The 46.8 micrograms of folate in ½ cup of brussels sprouts bolsters red blood cell health and is important to pregnant women as it helps prevent specific neural tube defects. With 247 mg of potassium per serving, brussels sprouts are a rich source of this mineral, which can help regulate your blood pressure and fluid balance. Brussels sprouts are also a source of vitamin E, most of the B complex of vitamins, iron, magnesium, phosphorus, zinc, copper, calcium, manganese and selenium. Brussels sprouts, along with other cruciferous vegetables, contain compounds known as isothiocyanates. Isothiocyanates may help prevent cancer by promoting the elimination of potential carcinogens from the body. Isothiocyanates may also reduce your risk of heart attack. What Are the Benefits of Fava Beans? What Is the Nutritional Value of Carrots?